In “The Wilderness Years” television documentary (1981) actor Robert Hardy faithfully captures Martin Gilbert’s image of Churchill in the Thirties: politically frustrated, less than effective as a father and a husband, worried over ominous developments in Germany—yet also enjoying his most productive decade as a writer and historian. In October 2015, Hillsdale College’s Center for Constructive Alternatives presented four key episodes from the famous “Wilderness Years” television drama featuring Robert Hardy as Winston Churchill during the momentous 1930s. Realizing we were risking taking these excerpts considerably out of context, we introduced each with a background discussion, and followed up with remarks by Robert Hardy himself. The stark danger of Germany reaching air parity or superiority with Britain was a contentious issue in Churchill’s “wilderness years,” as he continually preached to doubtful listeners the need for Britain to rearm, particularly with the Royal Air Force. In this episode we meet two of the people who, at the risk of their careers, provided Churchill with secret information on German rearmament. It ends dramatically in Parliament, as Prime Minister Baldwin admits that Churchill has been right about the pace of German rearmament. Inject a note of reality, which the drama doesn’t mention. In fact, the government knew some of Churchill’s official sources and could not withhold access. He was more than a back-bencher without office. He was the senior Privy Counselor of the Realm, and thus entitled to such information. But they did not know, I believe, that Morton and Wigram were personally involved. We should understand that neither Baldwin nor Chamberlain were wholly in denial. Both initiated the rearmament programs without which Churchill could not have fought the Battle of Britain. It is true, as Chamberlain implies, that the RAF was outnumbered in quantity but not, they thought in quality—though that too proved debatable. This episode ends in the House of Commons, where Baldwin, confronted with the obvious facts, attempts to quiet his critics by admitting misjudgments and promising action—which he did take, insufficiently, after becoming prime minister that June. Robert Hardy then delivers one of Churchill’s great orations. Seated behind Churchill is his red-headed friend and champion Brendan Bracken (perfectly played by Tim Piggott-Smith). 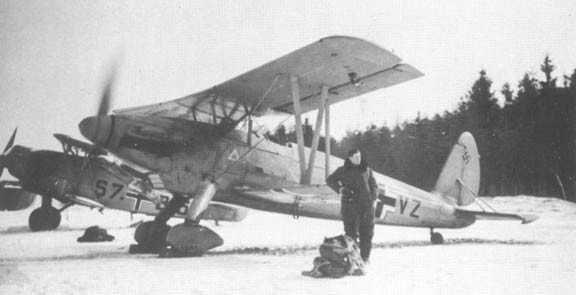 Featured Image: A German pilot stands beside a pair of Arado Ar 68s. These fighters, developed for the Luftwaffe in the mid-1930s, were one of the first fighters produced during Germany’s rearmament.